So, what's a poor mama of a once-actor, brand-new almost-royal supposed to do with her life now? Well, the source says Ragland is contemplating "starting her own private practice" as a social worker, and in the meantime will continue to work as a yoga instructor. Maybe the queen could use a little yoga? 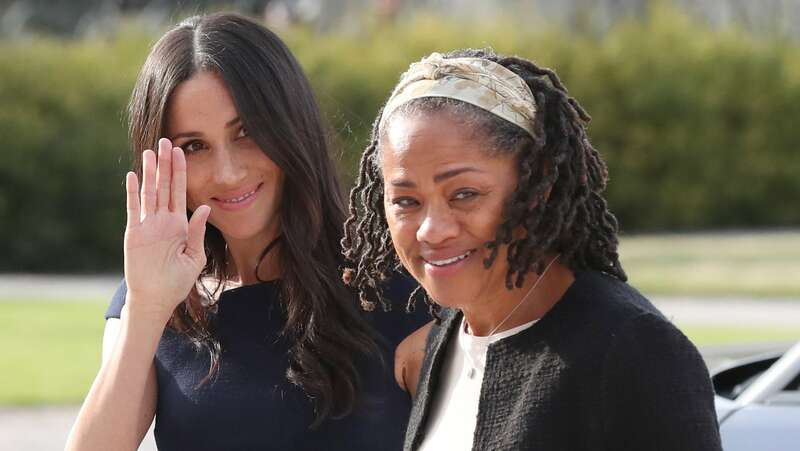 Don't feel too bad for Markle's mama, though. Since she arrived in London on Wednesday, Ragland has been chilling with some of her new in-laws, including Prince Charles and Camilla, Duchess of Cornwall, and Prince William and Duchess Catherine of Cambridge (whom you might know better as Kate). Ragland also had tea at Windsor Castle with none other than the queen herself on Friday (don't worry, Markle and Harry were there to coach her on how to hold her teacup and handle the watercress finger sandwiches). Markle and Harry were all smiles on the way to tea, waving to photographers and crowds from the back seat of a black SUV. We're thinking conversation over tea did not touch upon the very prickly subject of Markle's father, Thomas, who will not be attending the much-anticipated nuptials tomorrow — presumably because of recent heart surgery, but also possibly because of a supposed behind-the-scenes scandal having to do with staged paparazzi pics (you can't make this stuff up). Instead, Markle has tapped Prince Charles to walk her down the aisle at St. George's Chapel, where Markle and Prince Harry will marry in front of 600 guests. The tea at Windsor Castle with the queen is the last time the soon-to-be married couple will see each other before the wedding. A source for Us Weekly says that tonight, Markle and her mom are headed to five-star hotel Cliveden House, where they will (try to) get some sleep before making their way to the castle tomorrow — by carriage, naturally — for the big nuptials. So, yeah, maybe it's a good week to take your mom for that mother-daughter mani-pedi you keep promising. And a carriage ride in Central Park if you can swing it.